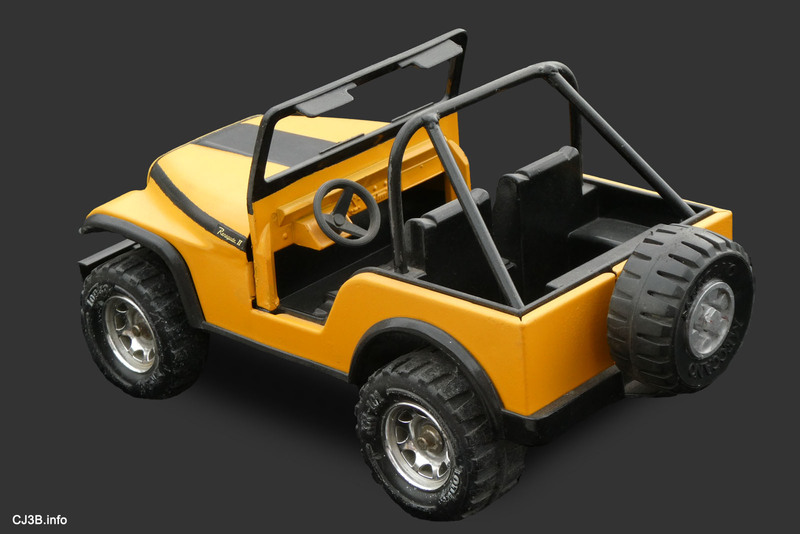 This 1999 repainting project used a brown 1970's Tonka CJ-5 as the starting point. The photo was taken when I got the Jeep a couple of years earlier. The front bumper was broken off, but the metallic paint was in pretty good shape. I was planning to just clean it up a bit. That is, until the spray paint accident that happened while I was working on the U.N. peacekeeping Jeep. I had the Jeep on the workbench because I was measuring it for the homemade windshield on the U.N. project. When the can of white Tremclad burst, the Jeep got a lot of paint on the plastic interior as well as the body. I took the hint and decided to do another custom model. 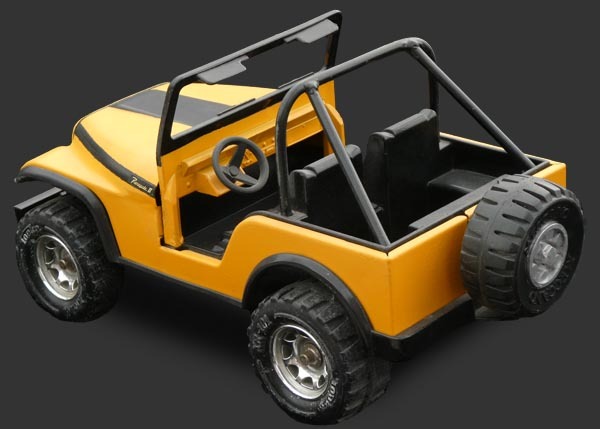 The prototype I chose was a stock Jeep that caught my eye partly because of a classic 70's AMC promotional photo that showed the limited edition 1971 Renegade II in Baja Yellow, Riverside Orange, and Mint Green. The cropped published version looked like it might have been taken at a beach, but the original shows it to be a snowy parking lot. The V6-powered Renegade also interested me because I recently found out it was the last model produced at the Canadian Kaiser Jeep factory, in 1969. I thought my garage floor splattered with white paint matched the look of the prototype photo quite well. You can still see some white spray on the Jeep's tires too. The roll bar was fabricated in the same way shown in my photos of Repainting a Tonka as a Fire Jeep. The spare tire is a Meccano part that matches the Tonka wheels fairly well. The paint I used for the "Baja Yellow" was actually "School Bus Yellow". I did a simplified version of the graphics on the Renegade II by masking and painting with black. The wide black hood stripe on the prototype was advertised as "reducing glare." I printed tiny copies of the Renegade II logo, and glued them in the correct location at the end of the hood stripes. 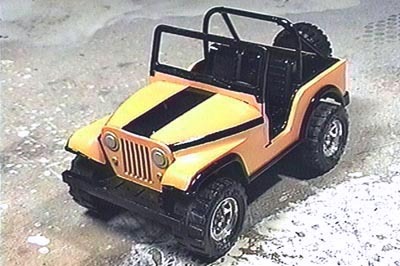 See more Tonkas on the Toy Jeeps Pages.